Analysis: Edelman was quiet through the early stages of the contest, but he made several big plays late in regulation and overtime to boost his overall line. After leading the team in targets, catches and receiving yardage, the veteran now has 16 receptions (on 23 targets) for 247 yards through a pair of postseason games. Edelman will be a key cog in the passing attack once again in the Super Bowl against a Rams team that has been vulnerable to opposing wideouts this season. 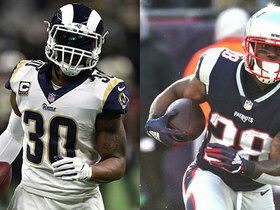 Analysis: Edelman surpassed Reggie Wayne (93) for the second-most postseason receptions of all time, as his 98 catches are eclipsed only by Jerry Rice's gargantuan total of 151. While Edelman's no Rice, he's the unquestioned No. 1 wide receiver in New England heading into what should be a high-scoring AFC championship game in Kansas City next Sunday. Analysis: Edelman's five-yard touchdown completed the scoring with 3:26 remaining. He's the clear-cut No. 1 wide receiver for New England heading into the playoffs, which is quite a feat for a guy who couldn't even play in the season's first four contests due to a PED-related suspension. Analysis: Edelman was the lone productive target for quarterback Tom Brady, accounting for more than half of his 126 passing yards. His touchdown was a 32-yarder on fourth down in the third quarter. With fellow wide receiver Josh Gordon (suspension) away from the team now, Edelman should see all the targets he can handle against the Jets in Week 17. Edelman hauled in nine of 12 targets, turning in 86 receiving yards and one touchdown during Sunday's 34-33 loss to the Dolphins. Edelman logged 66 out of a possible 74 snaps on offense in Sunday's 24-10 win over the Vikings, en route to carrying two times for 35 yards and hauling in three of his eight targets for 25 yards. Analysis: Edelman has had better days in terms of efficiency, but he remains heavily involved in the Patriots offense and is therefore a solid option in PPR formats thanks to his ample snap count and reliable target share. Edelman (ankle) caught four of five targets for 84 yards and a touchdown in Sunday's 27-13 win over the Jets. Analysis: Edelman's 21-yard touchdown broke a 13-13 tie with 1:52 remaining in the third quarter. He's eclipsed 50 yards in six of seven games played this season and has three touchdowns to boot, so roll Edelman out with confidence against the Vikings in Week 13. Edelman (ankle) practiced fully Wednesday. Analysis: The Patriots' bye week gave Edelman the healing time he needed to get ready for Sunday's game against the Jets. As a result, he's poised to maintain his high-volume role in the New England offense this weekend. Edelman (ankle) was on the field for Wednesday's practice, Zack Cox of NESN.com reports. Analysis: Wednesday's practice is the only session of the week for the Patriots, who are on bye. Edelman was forced out of this past Sunday's loss to the Titans, but the severity of his ankle injury has subsequently been downplayed. While it's expected Edelman will be limited to some degree at practice next week, the assumption remains that he'll be able to fill his usual starting role in the slot Nov. 25 against the Jets. The ankle injury Edelman suffered Sunday against the Titans is not considered serious, Adam Schefter of ESPN reports. Analysis: Per the report, Edelman is not expected to miss much, if any, time. Working in his favor is that the Patriots are on bye Week 11, which will afford Edelman added healing time in advance of the team's Nov. 25 tilt against the Jets. As that contest draws closer, we'd expect Edelman to be listed as a limited practice participant, but for now his chances of being ready to play Week 12 are looking favorable. Edelman was forced out of Sunday's game against the Titans in the fourth quarter with an ankle injury. Analysis: Prior to his exit from the contest, Edelman -- who was previously dealing with an ankle issue before being removed from the Patriots' injury report Friday -- caught nine of his 12 targets for 104 yards. He'll no doubt benefit from the added healing time provided by the team's upcoming Week 11 bye. Edelman (ankle) does not carry a Week 10 injury designation in advance of Sunday's game against the Titans. Analysis: After being limited Wednesday and Thursday, both Edelman and Cordarrelle Patterson (neck) were removed from the team's injury report Friday. As a result, the Patriots list six players as questionable this week, in a game that will feature a coaching matchup between Bill Belichick and one of his former players, Mike Vrabel. Now minus an injury designation, Edelman is poised to maintain his high volume role in the New England offense on Sunday. Edelman (ankle) was listed as limited at Wednesday's walk-through practice, Mike Reiss of ESPN.com reports. Analysis: Edelman logged 64 of 71 snaps on offense in Sunday's win over the Packers, hauling in six of his 10 targets for 71 yards, rushing twice for 28 yards and completing a 37-yard pass. With no reported setbacks coming out of that contest, it's assumed his limitations Wednesday were mainly for maintenance purposes. Edelman caught six passes for 71 yards, rushed two times for 28 yards, and completed his only pass attempt for 37 yards in Sunday's 31-17 win over the Packers. Edelman (ankle) is listed as active for Sunday night's game against the Packers. Analysis: Edelman played 96.1 percent of the Patriots' offensive snaps in Week 8, and assuming no setbacks Sunday night, he should see a steady flow of targets as QB Tom Brady's most trusted receiving option in a passing attack minus star tight end Rob Gronkowski. Edelman (ankle) is expected to play Sunday night against the Packers, Adam Schefter of ESPN reports. Analysis: Good news for those hoping to use the Patriots' PPR ace in Week 9 fantasy lineups. He'll be needed by the team Sunday, especially with the status of key play-makers Rob Gronkowski (back) and RB Sony Michel (knee) to be determined in pre-game warmups. Edelman (ankle) is listed as questionable for Sunday's game against the Packers, Mike Reiss of ESPN.com reports. Edelman (ankle) was limited at practice Thursday, Mike Reiss of ESPN.com reports. Analysis: Edelman missed Wednesday's practice, but we'll attribute his absence to an illness that the Patriots no longer list on their Week 9 injury report. So far there's nothing to suggest that either Edelman or Josh Gordon (hamstring) are in any danger of missing Sunday night's contest against the Packers, but we'll let you know if that changes. Meanwhile, tight end Rob Gronkowski (ankle/back) did not practice Thursday, so his status for this weekend's action is less clear. Edelman (ankle/illness) returned to practice Thursday, Mike Reiss of ESPN.com reports. Analysis: Edelman was one of five New England players who sat out Wednesday's walk-through practice, but his return to the field Thursday puts him on track to play Sunday night against the Packers. We'll circle back on Edelman s' status later Thursday to note his official level of practice participation. 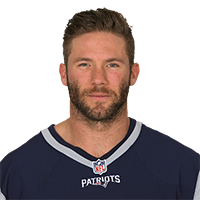 Edelman (ankle/illness) was one of five New England players who sat out Wednesday's walk-through practice, Doug Kyed of NESN.com reports. Analysis: Meanwhile, 10 players were listed as limited participants. Kyed suggests that it's possible that the Patriots were simply giving players like Edelman -- who is feeling under the weather -- an extra day of rest after Monday's win over the Bills. In any case, Edelman played 96.1 percent of of the team's offensive snaps in Week 8, so it's unlikely that his listed ankle issue is a serious threat to his status for Sunday's game against the Packers. Edelman didn't practice Wednesday due to an ankle injury and an illness. Analysis: Edelman was on the field for 73 of the Patriots' 76 offensive snaps in Monday's 25-6 win over the Bills, hauling in a season-high nine passes (on 10 targets) for 104 yards to go along with two carries for 13 yards. With no reported injury setbacks coming out of that game, it's expected that the illness is the main reason behind his absence from the first practice of Week 9. A return to the field Thursday in any capacity would put Edelman on track to play Sunday against the Packers. Edelman caught nine of 10 targets for 104 yards in Monday night's 25-6 win over the Bills. Analysis: Edelman's team-leading yardage total included a clutch, 26-yard reception on third down to begin the fourth quarter. That play not only helped set up a New England touchdown to extend its lead, but also gave Edelman his longest gain through four appearances this season. Although his two-game touchdown streak was snapped, Monday was still Edelman's best performance thus far. He'll now look forward to a Week 9 meeting with the Packers. Edelman (heel) caught five of eight targets for 36 yards and a touchdown in Sunday's 38-31 win over the Bears. Edelman (heel) is listed as active for Sunday's game against the Bears. Analysis: As expected, Edelman is available Sunday and he'll remain a key target for QB Tom Brady, particularly with tight end Rob Gronkowski (who leads the Patriots with 405 receiving yards) sidelined with a back injury. In his two games since returning from a four-game suspension, Edelman has caught 11 of his 16 targets for 111 yards and a TD, re-establishing his fantasy utility, notably in PPR formats, in the process. Edelman (heel), who is listed as questionable for Sunday's game against the Bears, is expected to play in the contest, Ian Rapoport of NFL Network reports. Analysis: Official confirmation on Edelman's status will come when the Patriots release their inactive list around 11:30 a.m. EDT, but the slot man's expected availability counts as welcome news with star tight end Rob Gronkowski (ankle/back) sidelined. Edelman has already been targeted 16 times in his two appearances since returning from a suspension, but the wideout's role could grow even larger in Week 7 now that there's one fewer mouth to feed in the passing attack. Edelman (heel) is listed as questionable for Sunday's game against the Bears. Analysis: Edelman -- who was one of 10 players listed as questionable by the Patriots -- was able to practice in limited fashion all week, so it's expected he'll be ready to play come Sunday. His status is worth verifying in advance of the 1 p.m. EDT kickoff, however. Edelman (heel) remained limited at practice Thursday. Analysis: Edelman was also limited Wednesday, but the fact that he's been able to participate in both of the Patriots' Week 7 practices suggests that his heel issue is probably minor. That said, it's plausible that he'll end up with a "questionable" tag for this weekend's game against the Bears. It's a 1:00 ET kickoff, however, ensuring that those invested in Edelman this week will know his playing status before the first wave of games Sunday. Edelman was limited at practice Wednesday due to a heel injury. Analysis: Edelman is a newcomer to the injury report this week, joining nine other Patriots who were listed as limited at practice. In his second contest back from a four-game suspension, Edelman logged 71 out of a possible 78 offensive snaps in Sunday's 43-40 win over the Chiefs. With no reported setbacks coming out of that contest, it would be surprising if the Patriots' slot ace was in any danger of sitting out this weekend against the Bears. Edelman caught four balls for 54 yards and a touchdown Sunday against the Chiefs. He also added a seven-yard carry in a 43-40 victory. Analysis: Edelman only trailed Josh Gordon in targets (seven to nine) Sunday, but the former was the Patriots' lone recipient of a touchdown pass, resulting in the superior fantasy line. The 32-year-old hasn't lost his status as Tom Brady's preferred short- to mid-range receiving option after serving a four-game suspension. Edelman should continue to be a strong PPR option after racking up 11 receptions (16 targets) in two games since his return. Edelman (suspension) brought in seven of nine targets for 57 yards and returned two punts for 20 yards in the Patriots' 38-24 win over the Colts on Thursday. 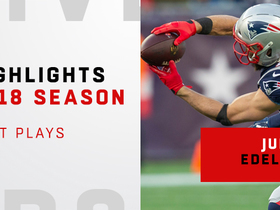 Analysis: Edelman jumped right back into action and already seemed to be in midseason form, ranking tops among Patriots wideouts in receptions, receiving yardage and targets. The veteran possession man averaged a typical 8.1 yards per grab, laying claim to his trademark role in the short passing game in his first game back. Edelman appears set for another robust role for the remainder of this season and will look to build on his solid debut against the Chiefs in a Week 6 battle. The Patriots have officially activated Edelman to their 53-man roster, Adam Schefter of ESPN reports. Analysis: With his four-game suspension having been served and Edelman moving past the ACL injury he sustained last August, the Patriots will welcome back QB Tom Brady's trusted target Thursday night against the Colts. It remains to be seen how much (if any) rust there might be on Edelman's game in his return, but we suspect that he'll see enough targets Thursday to merit fantasy consideration, notably in PPR formats. Edelman (suspension) rejoined the Patriots on Monday and is expected to be reinstated to the 53-man roster later in the day, Matt Dolloff of 98.5 The Sports Hub Boston reports. Edelman, who is slated to serve a four-game suspension to start the season, relayed Tuesday that his surgically repaired knee continues to improve, NESN.com reports. "It's definitely feeling better and better," Edelman noted. "That's for sure. There's still things you have days where it's like, oh, this is tired. This. That. Our training staff has been working hard. They've been on top of it, and just doing all the little stuff, little exercises to keep stuff strengthened, this, that. It's been a grind." Edelman (suspension) went through individual drills at practice Tuesday "with his trademark quickness," per Mike Reiss of ESPN.com. Analysis: This is worth mentioning, given that Edelman -- who is bouncing back from an ACL injury that cost him last season -- didn't appear to be running full-go on his last couple of reps during team drills at Monday's practice. With no evidence of a setback having occurred, Edelman will continue to eye a return to regular-season action in Week 5, upon the completion of his four-game suspension for violating the NFL's performance enhancing substances policy. Edelman (suspension) didn't appear to be running full-go on his last couple of reps during team drills at Monday's practice, Mike Reiss of ESPN.com reports. Edelman (suspension) played 16 offensive snaps in Thursday's preseason game against the Bengals, Mike Reiss of ESPN.com reports. Analysis: Playing with Brian Hoyer on an ugly night for the New England offense, Edelman finished the game without a target but at least avoided any setbacks in his first contest since last August. While he should get some work with Tom Brady in the next two preseason games, Edelman will need to wait until Week 5 to make his 2018 regular-season debut. Edelman will not appeal his four-game suspension in federal court, Tom Pelissero of NFL.com reports. Edeleman's appeal of his four-game suspension was denied Tuesday, Adam Schefter of ESPN reports. Edelman's appeal of his four-game suspension will be heard Monday, ESPN.com's Dan Graziano reports. Edelman (knee) faces a four-game suspension for violating the NFL's performance enhancing substances policy, Adam Schefter of ESPN reports. Analysis: Per the report, Edelman's suspension is under appeal, but at this stage, it looks like the wideout -- who is bouncing back from a torn ACL -- is in line to miss the first quarter of the Patriots' season. If the punishment stands, added targets will be available for the likes of Chris Hogan and Jordan Matthews early on, while sixth-rounder Braxton Berrios could stick with the team and carve out a role as a slot option. Edelmen (knee) was seen participating in team drills Tuesday, Doug Kyed of NESN.com reports. Analysis: This is the first time that Edelmen has participated in team drills in practice sessions that were open to the media this offseason, and it's certainly a huge step in the right direction for the wideout as the team opened up its mandatory minicamp. The Patriots will likely continue to ease their top wideout back into the swing of things as the offseason progresses, but all signs are pointing to Edelman being ready to take on a large workload at the start of the 2018 season. Edelman (knee) fielded punts and participated in a few offensive drills during Tuesday's OTA practice, Karen Guregian of the Boston Herald reports. Edelman, who missed last season with a torn ACL, was on the practice field Monday, NESN.com reports. 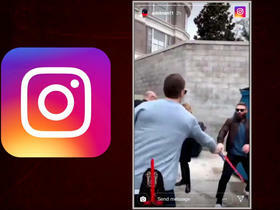 Edelman (knee) was able to run with resistance bands Tuesday, NBC Sports Boston reports. Analysis: At this point in his rehab from October surgery to repair a torn ACL in his right knee, Edelman seems to have progressed as anticipated. It's still likely that he'll face limitations by the time the Patriots' offseason program begins, but the expectation remains that he'll be a full participant for training camp. Edelman, who will turn 32 in May and is under contract through 2019, should settle back into his normal role as the team's top slot receiver during the upcoming season. Edelman (knee) is expected to be ready by training camp, Jeff Howe of the Boston Herald reports. Analysis: Edelman originally tore his ACL in the third week of the preseason and spent the entire 2017 season on injured reserve. He'll be around 11 months removed from surgery by the time training camp rolls around, so a late July or early August return is entirely realistic given the 9-to-12 month recovery timeline that typically accompanies this kind of injury. The soon-to-be 32-year-remains under contract with New England through 2019 thanks to the two-year contract extension he signed last summer. Edelman (knee) said he can't provide a timeline for his rehab from a torn ACL, Adam Schefter of ESPN reports. 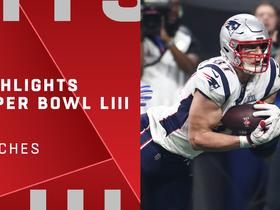 Watch New England Patriots wide receiver and Super Bowl LIII MVP Julian Edelman's best plays from his 2018 season. 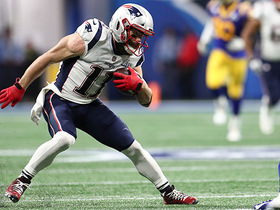 NFL Network's Nate Burleson breaks down New England Patriots wide receiver Julian Edelman's MVP performance in Super Bowl LIII. 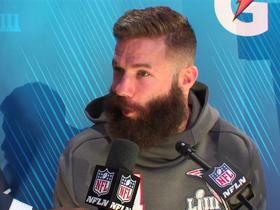 NFL Network's Elliot Harrison and Maurice Jones-Drew debate whether New England Patriots wide receiver Julian Edelman is destined for the Hall of Fame. 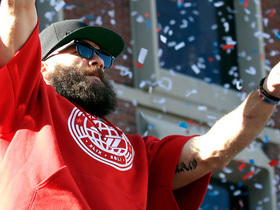 Super Bowl MVP and New England Patriots wide receiver Julian Edelman takes in crowd during Super Bowl LIII parade. 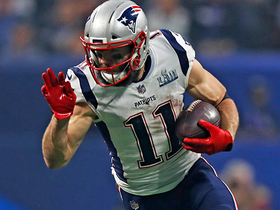 NFL Network's Daniel Jeremiah breaks down why New England Patriots wide receiver Julian Edelman found so much success against the Los Angeles Rams in his Super Bowl LIII MVP performance. 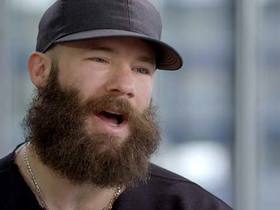 NFL Network's Andrea Kremer takes a look at the relationship between New England Patriots wide receiver Julian Edelman and his father. 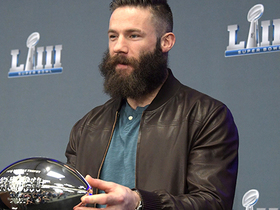 NFL Network's Deion Sanders catches up with New England Patriots wide receiver Julian Edelman at Super Bowl LIII Opening Night.